These mods were the direct result of a search for a moddable machine that must have been sold in the hundreds of thousands of units, but now sits in a lot of peoples racks unused. Thats not to say there aren't some useful effects available on this unit, but these days many people will have replaced it with a computer, or just something better from the vast number of superb secondhand FX units selling for virtually nothing these days. As a result many Zoom units are now living in that twilight zone between not being good enough to be good, but not really being bad enough to be interesting. 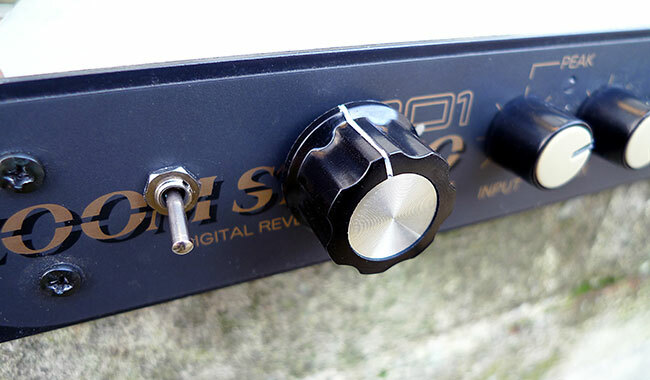 Our mods add a reclocking knob, a 14 way RAM decimation switching matrix and most importantly, a power switch! Only someone who hasn't spent hours reaching around the back of racks, or trying to figure out exactly which power supply in the 4 way sockets is the one for the Zoom, would underestimate the usefulness of something as simple as a power switch! We would advise replacing the official Zoom power supply after these mods have been installed. Using the reclocking knob to run the unit at higher than normal frequencies means the unit will pull more current, and the nominal 300ma maximum supplied by the standard PSU is no longer sufficient. We would advise using a 9v PSU capable of delivering 500ma or more. If you want your ZOOM 1201 modded get in touch using the CONTACT form.